5.67 points at 30 votes (rank 697). 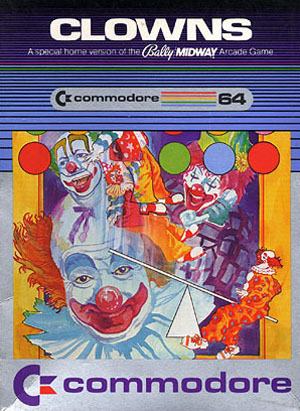 The game Clowns is on hand as a cartridge and can only be operated by paddles in port 1, but there is also a diskette version which can be played using a joystick. This game is about throwing 2 clowns up through the air with the help of a rocking springboard, which then pick up coloured balloons. For the collected balloons you get points. The jumping clown has to land exactly on the free space of the board or it will fall. After 3 falls the game is over. To the right and left there are each 2 platforms. Here the jumping clown starts. 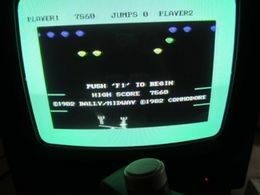 While there is a midway arcade game called Clowns, and this game does have a bally midway copyright on it, it is actually a pretty accurate conversion of the Exidy arcade game Circus, with the scoring, music, and sounds taken from that game. An alternative name of this game was Acrobat. Simple unicoloured HiRes Graphics. 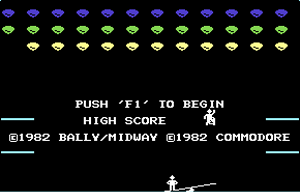 The score display in text is located in the upper screen line, same as the highscore and game hints. There is no background music, but in addition to bounce and balloon pop sounds, a few short monophonic tunes are played. One when clearing a row, one when starting a game, and one when you fall. Do not let yourself get irritated by the jumping direction of the clown. When the clown touches a balloon, his jumping direction turns round and you just need to stay with the rocker where you are to catch him again. Collect all balloons except one from all three rows. Now there are only three balloons in the game. Collecte them one after the other from top to bottom. The advantage: An extra life and the higher points in the uppermost row. The reason is: when you empty the lowest row, it is harder to reach the upper row, as the lower row is filled up again. FXXS: "It is rather funny to clear away rows with clowns instead of balls, but unfortunately the steering is not realized very well. I personally did not make it to do well-directed jumps. Hence 4 points for (longtime) fun, but I do not regret trying the game, it is quaint enough not to be annoyed about that. *g*"
Borna: At that time, the game was very popular - but at least very famous. In pairs the game was much fun, by oneself, however, it was not really the bringer. Anyway it is a classic which is wrongly (still, in 12/06) in the FLOP charts. TheKills: "I got the game by accident on a boot sale and I was then as today positively touched. I like it, although it can get boring very quickly... but it doesn't need to." 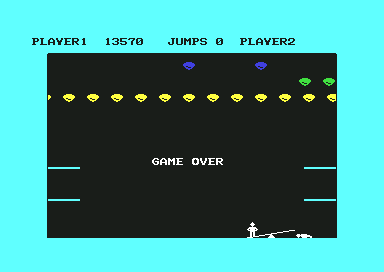 Shakermaker303: "A rather average game, which was sometimes rather difficult due to the handling. For this half of the highest number of points I would say." H.T.W: "A very simply made game, which can be lots of fun by its very good steering (only paddle version, also with mouse on the CCS64 an Vice)". 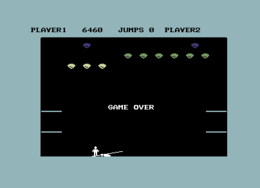 mombasajoe: "Aye, one of the early C64 games. To rate this on the same scale as a game from 1988 is of course very difficult. It is one of the few paddle games and in my opinion this way of controlling works very well. But concerning the gameplay itself not much happens. Difficult, according to the definition for me a clear "so-so" (3); including bonus for age and sympathy I give 4 points." Clowns in the Killer List Of Videogames. This page was last modified on 30 July 2016, at 00:01. This page has been accessed 19,066 times.